The Umbrella Policy - What does it do? Umbrella liability insurance covers you in many situations if you are held responsible for bodily injury, property damage, or personal injury. The product got its name because it adds a higher level of protection above auto, homeowners and boat policies, which are “primary” policies. Umbrella coverage kicks in after primary insurance is exhausted. 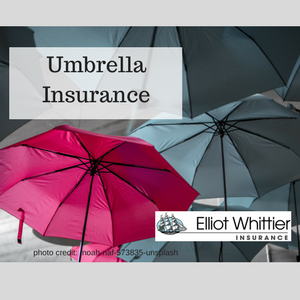 What’s more, an umbrella policy offers primary coverage for losses not covered by other insurance. Check out a real life story about umbrella insurance from one of our clients here. Check out this short video from our partner Travelers Insurance which illustrates how an umbrella policy protects you. What does primary insurance pay for? Liability insurance under auto and homeowners policies pays expenses (for example, an injured person’s medical care, rehabilitation and lost wages) because the policyholder was at fault through negligent actions. Liability coverage also pays for costs of defending against a claim or lawsuit. Who should consider an umbrella policy? Most homeowners should consider an umbrella, but especially those active in community affairs. Serving in civic, charitable, and religious organizations can lead to conflicts, claims, and even lawsuits. Even if a lawsuit is thrown out of court, you still must defend yourself. Umbrella liability coverage picks up these costs, whether or not a person is actually found to be liable. Defense costs generally are covered in addition to the liability limits of the umbrella policy. We can review your family’s coverage to ensure you are protected. Mention this article and call 617-846-5000 to find out more.